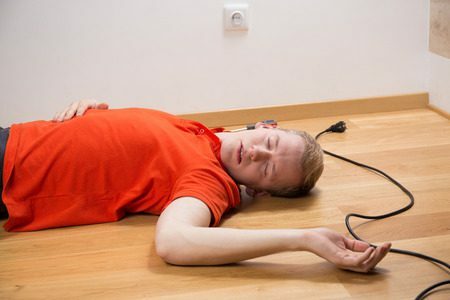 At Legal Expert, we have successfully helped many people make electric shock at work accident claims after they have been electrocuted at work. In this case, the claimant was an employee who was subjected to a 650-volt electrical shock whilst in the course of carrying out their duties. The electrical shock caused burn injuries to the claimant’s thumb and fingers. They alleged that the accident and resulting injuries were caused by a lack of suitable PPE. After negotiation, the claimant electric shock compensation claim amount of £22,000 in damages was awarded. How Common Are Electric Shock compensation Claims? Cases of being electrocuted at work are a much rarer form of workplace injury. According to statistics from the HSE for 2016/17 (Health and Safety Executive), we can see that being electrocuted at work is the rarest type of fatal injury at work. Electric shock injuries can range in severity and can very often require urgent medical attention as a first step. The electric shock compensation claim, in this case, was brought by an employee working on railway repairs. This is a profession wherein there were two fatalities due to this type of injury in 2014/15. The claimant alleged that their employers working practices and systems were unsafe. They also alleged that the defendant (employer) had failed to provide the worker making the claim with fellow employees who had the correct training to carry out the necessary duties. As part of the claim, medical evidence was obtained to support the claimants’ allegation. The medical reports confirmed that the claimant had been left with fingers which were prone to being stiff as well as leaving them with a lasting degree of numbness in their fingers. These affected their ability to work as well. What Injuries Can Be Sustained In Electric Shock At Work Compensation Cases? Electric shock injury compensation claims can involve a variety of injuries. At the time of the accident and resulting injury, the claimant was employed by the defendant. They were in the course of carrying out their usual duties which involved the testing of cabling for a railway. Whilst the claimant was dispensing these duties, a fellow employee turned the power back on. This caused the claimant to receive an electric shock of 650 volts. The electric shock injury that the claimant suffered caused burns to their thumb and fingers which were handling the wire. The claimant/ victim suffered from these burns and due to their serious nature needed to have skin graft surgery to graft new skin on to the burned areas on their index finger and thumb. As well as the physical injuries, the claimant also claimed that they had suffered from psychological trauma. This trauma had manifested in the form of nightmares. Subsequently, the worker was diagnosed to be suffering from PTSD, or Post Traumatic Stress Disorder. These symptoms did abate after some time. How Much Can I Claim For An Electric Shock? How much can I claim for electric shock injuries and accidents will vary depending on your individual case. In this case, the defendant did not dispute their liability and immediately admitted that they were liable for the accident. The only issue which they raised was electric shock claim amount which needed to be agreed between the two parties and how much compensation for electric shock would be awarded. After the defendant (employer) had admitted their liability for the accident they were able to enter into negotiations with solicitors acting on behalf of the claimant. The two parties worked to reach a settlement which was amicable. Unfortunately, an agreement could not be reached by the two parties, despite the goodwill between them. As such, the claimant requested that her solicitors commence proceedings in the County Court to recover the compensation amount she was seeking. This provides an answer to the common question, “I have had an electric shock at work, can I sue”. The case was heard in the local County Court branch two years after the accident occurred. In the County Court case, the claim was heard two years after the accident happened and the injuries were sustained. The judge reviewed and accepted the evidence, including the medical evidence. They took into account the fact that the claimant would continue to have a numb feeling in her hand and that the scarring which was seen would also be permanent. During the case, the judge noted that the claimant had not since been able to return to her full job role, and was so far unable to carry out her pre-accident job description/ role. In general the greater the voltage sustained, the greater the injury sustained. Electrical shock accidents can result in electrical injuries such as an electric shock, electrical burns, a loss of muscle control and even thermal burns. The HSE details these injuries and accidents here. If you have suffered an electric shock at work you need to talk to the specialists at Legal Expert today. We can help you to claim the compensation you are entitled to. Our no win no fee services mean you won’t have to pay anything upfront or during the claim. Your fees will also be claimed back from the other party. Contact Legal Expert today find out the average compensation for electric shock accidents. Talk to Legal Expert today and start your compensation claim for an electric shock at work accident. Call Legal Expert on 0800 073 8804 or email us about your case. You can also message us using our online chat feature. Find out more information about electric shock at work accident claims and how much compensation you could be entitled to with Legal expert. Find out about how to make an accident at work claim with Legal expert.